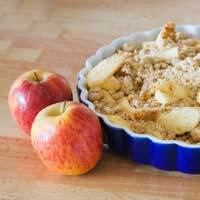 Crunchy, buttery sugar free crumble with piping hot fruit underneath. This simply mouth-watering dessert is just so easy to make and is a pudding that can be endlessly varied and adapted.Think seasonally when it comes to the fruit you use - apples are wonderful in the autumn and fresh berries delicious in the summer.You can serve this dish hot or cold, and with sugar free custard or ice-cream, as well as cream. The crumble itself can be given an extra twist through the addition of nuts, raisins or glace cherries. Serve the pudding after baking it in one large dish or make miniature versions in ramekins and present them individually. A tart ingredient, rhubarb is ideal for anyone who doesn’t like their puddings too sweet. Use sugar free rhubarb jam to sweeten the fruit filling if you can find it, if not try apricot. Preheat your oven to 200 deg C/400 deg F/gas mark six. Rub together your flour, butter and granulated sweetener together in a large bowl. Make sure you have really rubbed in all the lumps of butter, your mixture should look like soft breadcrumbs. Then prepare your rhubarb by washing it, trimming off the ends and chopping it into pieces about one inch in size. Place in a medium pan, pour in just enough water so the pieces of rhubarb are covered. Bring to the boil and allow to simmer for about five minutes. Once the rhubarb has started to break down into the water, remove from the heat and stir in your apricot jam. Take a large pie dish and pour the hot fruit mixture into it. Take your crumble topping and carefully sprinkle over the top. Make sure you cover all the fruit and that you’ve got a good inch or so of crumble. Place in the centre of the oven and bake until golden brown on top with bubbling fruit below. Serve with cream or sugar free ice-cream or custard. By using sweet apples in this recipe you should find you need little additional sweetener to the fruit filling. Add a little lemon juice to bring out the flavour. Preheat your oven to 200 deg C/400 deg F/gas mark six. Once again, rub together your flour, butter and granulated sweetener together in a large bowl. Ensure you have worked in all the lumps of butter. Add your oats, raisins, cinnamon and ground almonds. Stir in well. Tip your mixture out on to a baking sheet and place in the oven for just five minutes to crisp off. Then wash, core and peel your apples. Place in a medium pan with just enough water in to cover the apples. Bring to the boil and allow to simmer for about five minutes. Remove from the heat and stir in your apricot jam. Squeeze your lemon and add the juice. Then take a large pie dish and pour the hot fruit mixture into it. Take your crumble topping and carefully sprinkle over the top. Make sure you cover all the fruit and that you’ve got a good inch or so of crumble. Place in the centre of the oven and bake until golden brown on top with bubbling fruit below. This dish is just perfect with whipped cream and is as tasty cold as hot.